I swear, this is the last part! If you haven’t read parts 1 and 2 (on degrees of hybridization and the various systems out there), I highly recommend doing so first. Today, I’m covering the energy storage systems used by hybrids. Sorry about there being less images here, but there’s just not as much meaningful images I can use here. 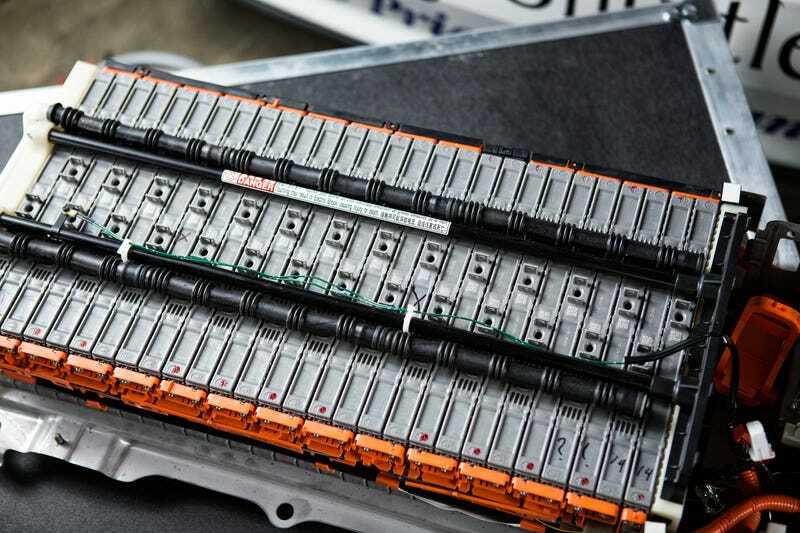 Most hybrids out there are using batteries of some kind - typically nickel-metal hydride or lithium ion, although some designs have used lead acid batteries (and most have a lead acid battery present). All batteries use chemical reactions to store electrical energy, and then reverse those reactions when energy is drawn from them. Lead acid batteries - the same type that you’re used to in a non-hybrid - are commonly used for the 12 volt system of hybrids, which includes lighting, running the engine computer and ignition system, and vehicle accessories. However, they’re heavy for their capacity, and they have rather poor durability (consider that 5 years is a good lifespan for a lead acid battery), so they’re poorly suited to being used as the high voltage batteries in a hybrid system. Nickel-metal hydride, or NiMH, batteries were what most early hybrids used (and some hybrids still use NiMH to this day), as they offer much higher capacity and potentially much better durability than lead acid batteries. The biggest downside of a NiMH battery is that efficiency and durability becomes much worse when charged over about 80%, and charging a NiMH battery without damaging it requires some advanced electronics. However, some manufacturers have mastered making NiMH batteries extremely reliable in hybrids - Toyota keeps their batteries between 40% and 80% state of charge, for instance. Lithium ion, or Li-ion for short, batteries are the current state of the art in battery technology, with higher energy density (at least in terms of gravimetric energy density, or weight) than NiMH, and the ability to use much more of their state of charge range without damaging the batteries excessively. This, ultimately, means that a Li-ion battery weighs less. The problem, however, is that Li-ion batteries currently cost more (although they’re coming down in price), and don’t work as well at low temperatures - as a result, Toyota actually uses NiMH batteries on their hybrids intended for more cost-sensitive or colder markets (such as most Canadian Priuses, as well as the Japanese-market Prius e-Four), as the added weight isn’t a huge problem for non-plug-in hybrids, due to their relatively low battery capacity. In plug-in vehicles, however, the energy density improvements of Li-ion batteries are such that they need to be used for reasonable range, and battery heaters are used to handle low temperatures. Thermal stability is also a concern, although in most cases has been managed sufficiently. Capacitors are another way of storing electrical energy in an electrostatic field, rather than in the form of chemical energy. This means that they tend to generate much higher power output (or accept much higher charging power) than batteries of the same weight or volume, making them extremely well suited to harvesting regenerative braking energy, and deploying it quickly. However, they have poor capacity for their weight and volume, meaning they can’t harvest much energy before they’re full, and modern Li-ion batteries are catching up in terms of power delivery, while having far better capacity. The only production application of large capacitors intended for energy storage from regenerative braking that I’m aware of, is the Mazda i-ELOOP system, but it’s only used to offset alternator usage, rather than to help propel the vehicle. It’s also combined with a lead acid battery, which is charged by the capacitor. As far as motorsport applications, Toyota has used a capacitor system in the TS030 and TS040 LMP1s, but with the advances in Li-ion technology, as well as the changes over the years in LMP1-H energy allowances, they’ve since moved to a Li-ion battery for the TS050. Various types of flywheel hybrid system exist, but they can essentially be classified into two types - electrical flywheels, and mechanical flywheels. Electrical flywheels use an electric motor/generator to spin a flywheel at extremely high RPM, and then generate electricity from the motion of that flywheel. Similarly to capacitors, these can take very high charging and discharging power. They’re not a popular solution for automotive applications (although they’ve been attempted a few times on buses as the sole energy source), but they’ve been used in several motorsports projects (most recently the Audi R18 before this year) successfully. Mechanical flywheel systems are the first non-electric hybrid we’ll discuss, and instead use either a CVT or slipping clutches to control the flywheel’s RPM relative to vehicle speed, and either increase or reduce flywheel RPM - all of these systems will act as parallel hybrids of some sort. As far as I’m aware, no mechanical flywheel hybrids have been very successful, and they’ve only even been attempted in motorsport. The last application I’m aware of is the Nissan GT-R LM NISMO, and, well, it didn’t work. The main downsides of flywheels are weight - although the flywheel itself can be lightweight nowadays, by using a carbon fiber flywheel, there needs to be heavy shielding to contain any failures of the flywheel - and gyroscopic forces exerted on the car by the flywheel affecting handling. Hydraulic hybrids use a hydraulic accumulator to store hydraulic fluid under pressure, pumping that hydraulic fluid up under braking, and releasing it through a hydraulic motor when the power is required. While battery electric hybrids are replacing them now, they have historically been popular for some commercial vehicles. Hydraulic hybrids are available in both parallel and serial systems. As I understand, they’re reasonably high efficiency (at least in parallel systems) and low cost, but low energy storage capacity. However, attention has moved to electric hybrids, as of late. Compressed air, or pneumatic, hybrids are essentially the same concept as hydraulic hybrids, but using air as the working fluid instead of hydraulic fluid. As I understand, there’s no production applications of this technology, but there’s been various concepts. One hypothetical advantage - as used in Koenigsegg’s concepts - is that the engine itself can be the air pump and motor, which also allows the compressed air to be used to burn more fuel if desired (as in a supercharger or turbocharger), instead of to directly propel the vehicle. As far as I know, though, most attempts at compressed air hybrids have been abandoned, due to the rapid advances in battery technology, due to electric vehicles. This concludes my three-part series on hybrids, but if you’ve got any questions or feedback, feel free to post.